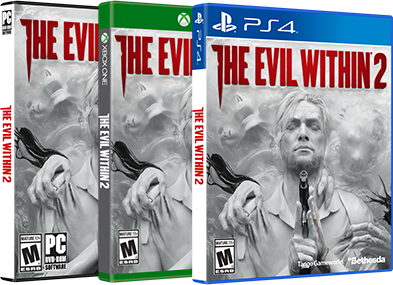 Scattered throughout the world of The Evil Within 2, you can find whispers from the past – events that Sebastian would prefer to forget. One such whisper can be found in a rather nondescript house we explored during our recent hands-on time with the game. And it was through this whisper that we learned even more about Sebastian’s fractured mind – including new insights into Sebastian’s mental state after the events of the first game. This is just one of the many locations you can visit in Union if you choose to explore, and all of them will provide you with certain benefits, whether they are much-needed resources or (like this one) a deeper dive into the game’s lore. The demo began with a heart-pounding chase through a strange facility, followed by a not-so-pleasant encounter with the vile photographer Stefano. Then we had a chance run-in with a Mobius agent who’s hiding out in a safe house, after which we’re given the opportunity to step out into Union and do some digging. 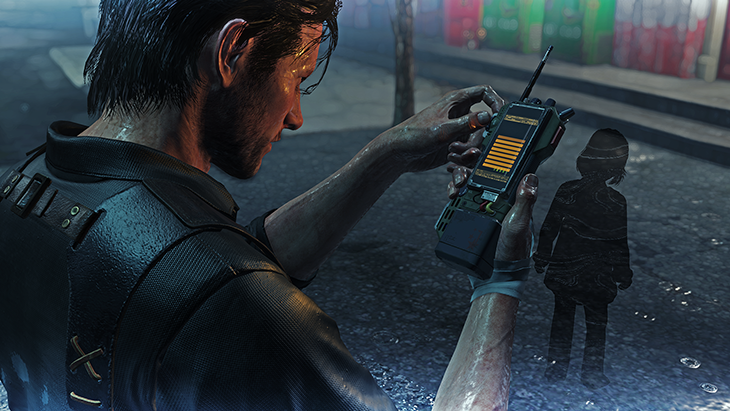 As we’re doing some light reconnaissance of the area surrounding the safe house, Sebastian’s communicator device alerts us from time to time, directing us to nearby points of interest, whether it’s a location worth investigating or a fallen Mobius agent who might be carrying some useful gear or resources. We’re creeping slowly down a dimly lit street when our communicator picks up a signal we’ve never heard before. It’s a recording of one of Sebastian’s psychological evaluations from after the events at Beacon Mental Hospital. We follow the signal and it leads us to a house. There’s nothing outwardly special about this house – its paint is peeling and the yard is overgrown, much like the other homes in Union – but there’s an old-fashioned hospital bed tipped over on the path leading to the front door. It’s not something we’ve seen anywhere else in Union, so of course we’re curious enough to enter. The house’s interior is unassuming; the whole structure could be found in any small town. There’s a TV in the living room, a modest bedroom, an empty kitchen, a locked door leading somewhere else in the house… Nothing that really catches our eye until we enter the garage. Here we see another old hospital bed, and on it, the note Sebastian received after Beacon requiring him to undergo an evaluation – the same evaluation we heard a recording of on our way into the house. We then reenter the main part of the house, and that’s where things get even more interesting. We immediately notice something is different. The living room is completely dark, save for some light coming from the TV, which is now on. We then see a flash of a scene on TV – a long, dark hallway, and at the end of it, Sebastian slumped over in a wheelchair, wearing the clothes he had on when he initially entered Beacon. Suddenly the world around us begins to flicker wildly between this house in Union and Sebastian’s memories of Beacon. We find more files detailing Sebastian’s psychological evaluation – files that use the phrases “paranoid delusions” and “fractured grip on reality” – and the things we learn have us doubting what we see. Is it all real? Or is it Sebastian’s mind playing tricks on him? Our shaky reality straightens itself out, but not the way we would have liked. Rather than returning to Union, we are now fully in Beacon, staring down the same long hallway we saw on the TV, with Sebastian now sitting motionless in the middle of a pool of blood. There’s still no movement as we get closer. When Sebastian reaches out toward his double, familiar long, sharp hands drag him down into the blood on the ground. Sebastian knows this is a new STEM system, built using Lily’s mind as the Core – a core that has no reason to know of the people, places or events from his first experience in STEM. He knows he’s the only link between the previous STEM system he entered and this one, so when his memories of Beacon start to bleed into Union, it only makes sense that he starts to question the reality of what he sees. It’s a race against time to find Lily before Union completely rips itself apart, but he’ll also have to worry about his own mind destroying itself in the process.